Jos Buttler 95 off 60 balls with 11 fours and two sixes, helped Rajasthan Royals to win against Chennai Super Kings by four wickets on Friday in the 11th season of the IPL match. 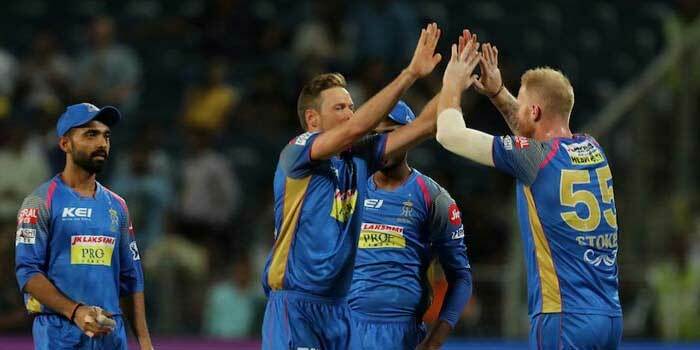 With this win Rajasthan Royals still in the fray to secure a place in the palyoffs. Chennai scored 176 runs for four wickets, while Rajasthan won the match by scoring 177 runs in 19.5 overs for six wickets. Butler named man of the match. This was the fifth win of Rajasthan in 11 matches and it has 10 points. But Rajasthan have to win the remaining three matches to secure a place in the playoffs. On the other hand, with this defeat, Chennai loss the fourth match off 11 matches and it has 14 points.